New mini training posted the first two Wednesdays of the month. Make sure to watch this space each week as this content will be taken down at the end of the month and you won’t want to miss it! Dr. Andrew Weil is a Harvard trained Doctor and is widely considered the “Guru” of Integrative Medicine. In this 3-minute video, Dr. Andrew Weil will take you through a few cycles of this breathing technique. I always find visuals to be helpful! When first learning how to create a high-quality breath, we want to focus on letting the belly expand primarily. Eventually, when you get comfortable with the belly breath, the rib cage will begin to expand as well. The idea is to keep your neck and shoulders as relaxed as possible when breathing. 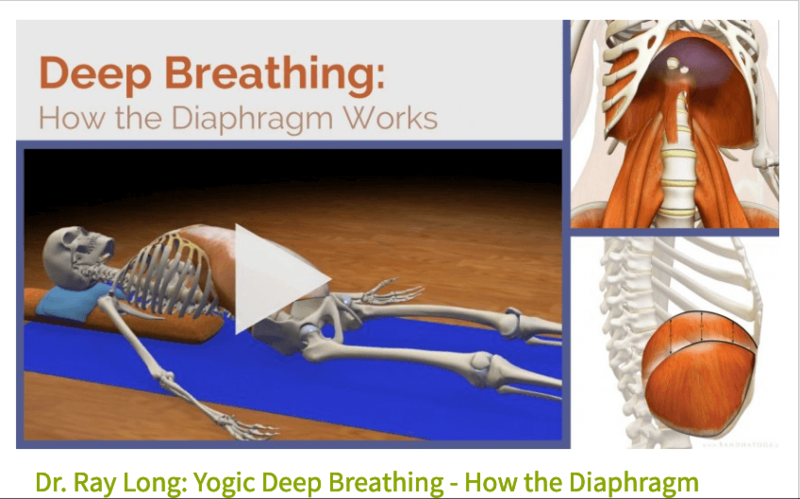 Note: The diaphragm is always active when we are breathing, however, when we focus on deep belly breathing, we use the diaphragm to its full potential. Check out week one’s mini-training for a stress relieving breathing technique. In the video, you’ll see Harry (that’s what I call our skeleton 😀 ) is lying over a bolster. This helps to create more expansion around the chest and rib cage making it easier to take deep breaths for many people. Dr. Ray Long will guide you through deep breathing in this video with the sounds of Tibetan bells. If you’d like to jump right to the Tibetan bell breathing, it’s at about 4 minutes into this video. If you’re an instructor (and you may or may not have learned this), when we breathe “into the belly,” our breath doesn’t actually go into the belly; it’s rather the movement of the diaphragm that helps to push the belly up and out.